This document has been created specially for users of older versions of SendConfirm, ReplyGuard and SendConfirm for Outlook. It contains answers to the questions frequently asked by existing users who are wanting to upgrade. If you have additional questions, or would like an online demo or an on-site trial, please contact us at sales@standss.com. We recommend that all users upgrade as soon as possible. The reason for this is that in recent times, Microsoft has started releasing more frequent updates and patches to both Windows and Office. It is difficult for us to maintain two “live” versions. We will only be doing code changes to the new version of SendGuard for compatibility with these updates from Microsoft. The upgrade is free to users who are on our Update Protection & Priority Support Maintenance Plans. All other users can upgrade for a discounted price from the Buy Now link on this page. If your organization has more than 20 licenses, please contact us at sales@standss.com. for upgrade prices with relevant volume discounts applied. 1 & 5: More useful prompts: Prompts on outgoing emails can now show Recipients and Attachments. You can select and unselect attachments and recipients directly from this screen. 1 & 2: Extra protection by identifying color-coding external recipients in RED. 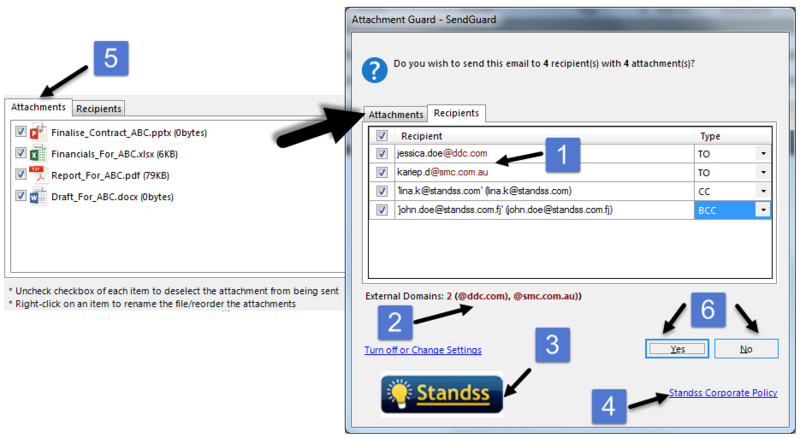 Recipients are now color-coded on both the Send Confirm and Reply Guard screens. 3 & 4: Company Branding and Links to your own Email Policies to increase security awareness in the organization. Data Loss Prevention: SendGuard can detect and warn you if emails contain credit card numbers, social security number etc. You can also use RegEx to create patterns for your own detection. Send Rules allow check and actions on outgoing emails: Use rules to carry out further checks on emails or carry out actions such as automatically CCing or BCCing additional recipients. I want to upgrade from SendConfirm or ReplyGuard to the FULL SendGuard. Do you have special pricing for that? Yes. Please contact us at us at sales@standss.com. for upgrade prices. How easy is to deploy the upgrade over the network? You can install SendGuard Version 3 directly over existing Version 2 installations. The old files will be replaced and the settings automatically imported over. Alternatively, you may want to uninstall the old version and deploy the new version with brand new settings. Our SendGuard Administrators Guide has instructions on deploying new settings using reg files or GPO. We can also create a Customized MSI (50+ users) and provide you with ADMX/ADML templates. Please contact us at us at sales@standss.com. for more information. Please email us at sales@standss.com. to arrange for an online demo, additional information or onsite trial.